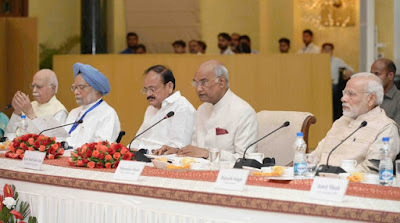 President Ram Nath Kovind presided over the first meeting of the national committee set up for a commemoration of the 150th birth anniversary of Mahatma Gandhi. 150th birth anniversary of Mahatma Gandhi will be commemorated from 2nd October 2019 to 2nd October 2020. Rs 150 crore has been allocated for this purpose under the Union Budget 2018. The National Committee to commemorate the 150th birth anniversary of Mahatma Gandhi comprises 125 members including 116 members from India and 9 international members. These 9 international members include two former Secretary Generals of the UN – Kofi Annan and Ban-Ki-Moon. The Committee includes PM Narendra Modi (as Head), Vice President Venkaiah Naidu, CMs, Union Ministers, former PM and Chief Justices of India. Question 1. Who is the head of the National Committee formed to commemorate the 150th birth anniversary of Mahatma Gandhi? Question 2. When will the 150th birth anniversary of Mahatma Gandhi commemorate? Question 3. Who presided over the 1st meeting of the National Committee set up to commemorate the 150th birth anniversary of Mahatma Gandhi?